Today I saw a pretty cool banner on Spotify by a casino called Vera&John. I clicked on the banner and was transferred to the gaming portal. My first impression was positive; the site looks cool, have lots of games and also have customization possibilities. I usually sign up pretty quickly to check out new gaming portals but I always try to find information about who is the operator of the gaming portal. Image 1. 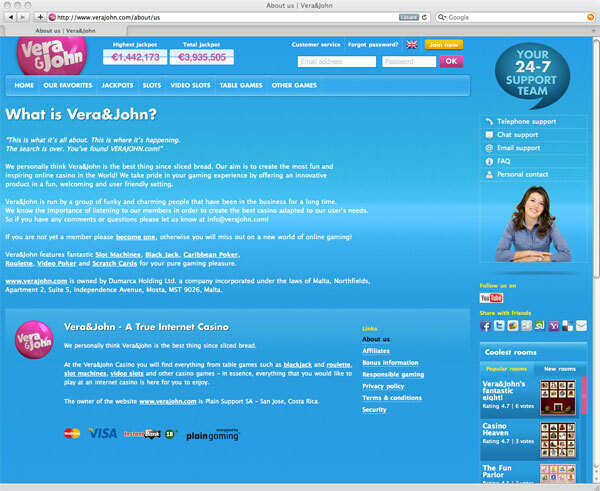 The about us page on verajohn.com. Credibility is one of the most important things for a player and I thought that (in the year of 2011) everyone knew that. But when you read the information on Vera&John you don’t get any information about the operator or the people behind it. So my advice to Vera&John is to be open about who you are. Show pictures of the people running the gaming portal and you will get more players!